Along with the emotional and artistic reasons for getting a tattoo there is also the aspect of inclusion. Gangs around the world use tattoos to indicate one's participation in their group. Though there is much symbolism and meaning behind these tattoos some gangs do not allow for the rest of the community in which they live to see them. This is especially prominent in the gangs of Asia, more specifically the Yakuza (Violence Group), the gangs of Japan. Many of these gangs use hidden tattoos which cover all of their body except for their heads, necks, wrists, hands, ankles, and feet to show gang inclusion. The tattoos do not extend to these extremities in order to allow the gang members to live seemingly normal lives with normal jobs without having anyone recognizing them as gang members. Though co-workers and acquaintances of Yakuza members may not know the member's association with the gang, the Japanese government requires that all members of the Yakuza gang to be identified and registered with the government (http://mobflix.com/tag/yakuza/). The tattoos which the Yakuza receive are not all just random symbols and pictures, many members have tattoos such as black rings around their arms to indicate the number of crimes which the specific member has committed. The tattoos are also as sign of strength and the unwillingness to assimilate themselves with the rules and norms of society. Some of the elaborate tattoo work done on the Yakuza members can take over one hundred hours. Though the Yakuza mainly make their money from illicit activities, such as gambling, drugs, prostitution and extortion, they are often looked at as a family that looks out for and protects its members. They even look out for the societies in which they live as well. After the 1995 earthquake in Kobe, Japan, the Yakuza not only helped financially by setting up financial aid, but they also arranged for a helicopter to come in and help the people in most dire need of it. Tattooing for the Yakuza is more of a form of inclusion than an intimidation tactic to warn everyone to stay away, even if it is not always seen that way. Sometimes these elaborate and beautiful works of art cause the wearer to be banned from places like public baths and hotels due to the fact that older generations still see these tattoos as signs of crime and violence (http://www.tao-of-tattoos.com/yakuza.html). "Archive for Yakuza." Weblog post. Yakuza. 27 Mar. 2009 . "The Yakuza Modern Day Japanese Mafia." Weblog post. 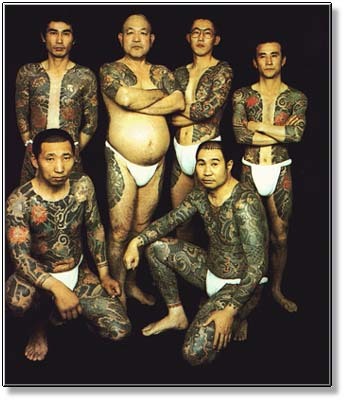 Yakuza - Japanese Mafia and Their Tattoos. 27 Mar. 2009 .